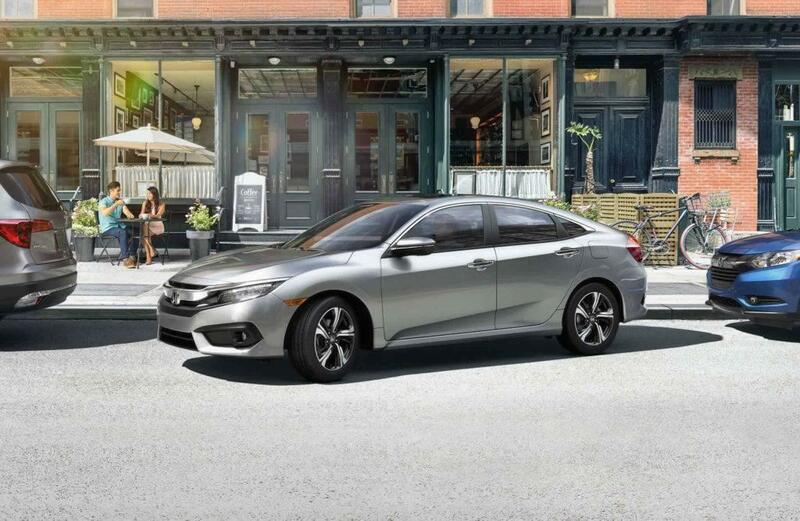 The 2017 Honda Civic Sedan has a design that will turn heads wherever you go, in the city or the country. With its aggressive exterior design and comfortable-yet-refined interior, you are sure to have a great and stylish vehicle as your commuting partner for the long road ahead. Comfortable seating for five and great cargo room allow you to take everyone on the trip and not have to leave any important things behind. The 2017 Honda Civic Sedan is ready to test drive here in Fontana, CA, at Rock Honda. The 2017 Honda Civic Sedan is available and ready to test drive near San Bernardino, CA, at Rock Honda. The 2017 Honda Civic Sedan inventory for sale in Fontana, CA, is vast and we have different trim levels to suit your needs, desired specifications and budget. Talk to our friendly Finance Department to learn more about financing options, and ask our knowledgeable and helpful sales staff any questions you have about cars on our lot! Contact us today to learn more! The cockpit of the 2017 Honda Civic Sedan exudes refinement and intelligent design. With the design-centric instrument panel with easy-to-read controls, you can focus more of your attention on the road ahead and not on trying to read a dim dashboard. The storage console in the middle is intelligently designed to fit what you need within arm’s reach, which streamlines the interior feel of the Civic. There are options for cloth or leather interiors, depending on trim level, and there are even available heated seats for added comfort no matter how cold it is outside. The eight-way power-adjustable driver’s seat ensures you find the most comfortable position for your driving experience, and the 60/40 fold-down rear seats offer you more cargo options than you might have thought possible in a sedan of this size. The possibilities are endless in the 2017 Honda Civic Sedan available at Rock Honda in Fontana, CA, so test drive today! The performance behind the 2017 Honda Civic Sedan is impressive and awe-inspiring. The 2-liter four-cylinder turbocharged engine that pumps out 174 horsepower comes with two options for transmissions, including a six-speed manual and Continuously Variable Transmission (trim level availability varies). The standard MacPherson struts and lightweight body structure makes it good at handling curves, wherever your journey takes you. There are multiple levels of technology (dependent on trim) that further heightens your driving experience. Technology such as the available Multi-Angle Rearview Camera, available Honda Satellite-Linked Navigation System™, and Honda LaneWatch™ all work to heighten your drive for comfort and safety. Ready to test drive this stunning sedan? Come down to Rock Honda! We have a great selection of the 2017 Honda Civic Sedan available and would love to answer all of your questions. Contact us today.